Yesterday leaders from Communities of Color for Climate Justice, a coalition of more than 50 grassroots racial and economic justice groups, and allies from environmental and workers’ organizations met with representatives from Carbon Washington one last time. We asked them to come to the table and collaborate on an equitable Initiative to the People in 2016, the concept for which is mostly developed and in alignment with our principles. This wasn’t the first time we’ve met with Carbon Washington leaders and communicated the need to work collaboratively on an Initiative, but it may be the last. Today, Carbon Washington intends to turn in signatures, which if valid, would send the Initiative forward to the Legislature and likely the voters in 2016; hindering opportunities for successful and equitable climate action and causing irreparable damage to the climate movement and our shared future. I-732 does not live up to the Principles for Climate Justice. Communities most impacted by climate change must be fully engaged in policy design and implementation to ensure equitable outcomes and policy choices and implementation approaches must be informed by and responsive to racial, environmental, and economic analysis. Leaders of color and allies have communicated with Carbon Washington more times than we can count over the last year. We met with representatives of Carbon Washington before I-732 was filed and asked them to come to the table to craft a better policy together. Unfortunately, these requests were ignored by the leadership, and they chose to go it alone, crafting a policy without input from communities they claim to be benefiting. They were able to garner enthusiastic supporters, but mostly from within a narrow-band of like-minded advocates. Without listening to stakeholders at the outset, our communities and others, Carbon Washington cannot be described as a climate justice approach. Engaging community in policy design is not only equitable, its also more likely to succeed. Carbon Washington polling shows I-732 “starts in a hole” with just 44% in favor before massive fossil fuel spending and without support from either the left and the right. People of color and communities with lower incomes must receive net-environmental and economic benefits. Environmental Benefits: The policy should ensure the reduction of carbon emissions. Climate change is a public health issue that disproportionately impacts people of color and communities with lower incomes. The policy’s environmental outcomes must therefore prioritize improvements to public health, especially through the equitable distribution of better air quality. Economic benefits: Revenue raised through any program should be used on strategies with a strong nexus with policies and programs that address climate change, and should be invested directly in lower-income communities, indigenous communities and communities of color so that the economic benefits outweigh the policy’s economic burdens. Addressing climate change equitably requires identifying communities where the cumulative impacts of pollution, lack of income/wealth, and racial discrimination stack up and targeting those communities for investment. I-732 fails to take even the first step of attempting to identify communities disproportionately impacted by climate change, let alone making targeted, equitable clean energy and clean air investments. Funding support for the energy needs of households with low incomes is a baseline, but rather than advancing equity in the clean energy economy, I-732 stops at a rebate. 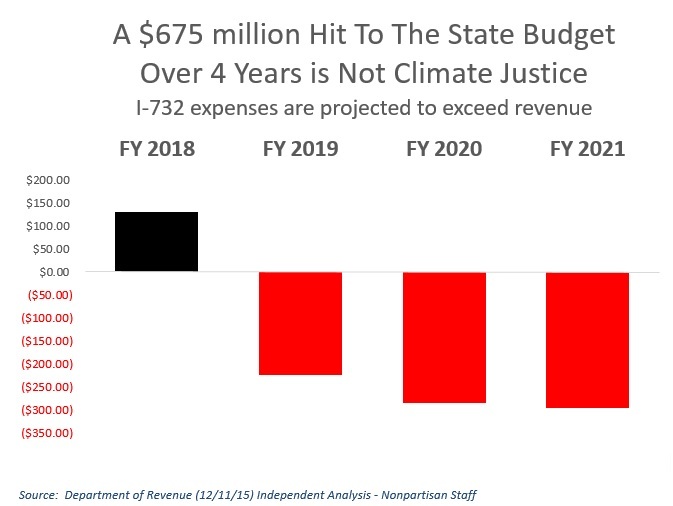 By opting for “revenue neutrality” rather than investment, I-732 misses a key opportunity to support low-income families to succeed in a low-carbon Washington State. What’s worse, I-732 claims to be revenue neutral, but is in fact a revenue negative policy. A recent analysis from the Department of Revenue estimates that Initiative 732 will cause a 675 million dollar shortfall by 2021. In a state that already struggles to adequately fund basic services and education we can’t afford to lose revenue. Even if I-732 were to be revenue neutral, carbon pricing will not succeed or be equitable without supporting a just transition to a clean energy economy. Revenue generated from carbon pricing should be used to bring net benefits to low-income people, ensuring all communities and people who work or want to work have access to the new economy we want to build. We’ve seen other regions implement carbon pricing policies that generate revenue rather than putting a hole in the state budget. Other regions that invest in solutions that reduce GHG emissions. Regions that focus on creating solutions that are accessible to our communities. We have also seen approaches claim to be revenue neutral and progressive, and turn out revenue negative and trend regressive (including British Columbia, Carbon Washington’s favorite example). I-732 wasn’t the only option, it was a choice Carbon Washington’s executive committee made, and it’s a choice we can’t support. Communities of Color for Climate Justice want a policy that includes low-income communities and communities of color, along with regional representation and a voice for workers, environmentalists and business in the oversight and implementation of carbon pricing. We believe that a voice for our communities in oversight would help assure that the implementation and enforcement of any policy stays grounded in equity and actual carbon reduction. I-732 again misses the boat on the importance of creating sound policy by embedding democracy and meaningful engagement in the enforcement process. 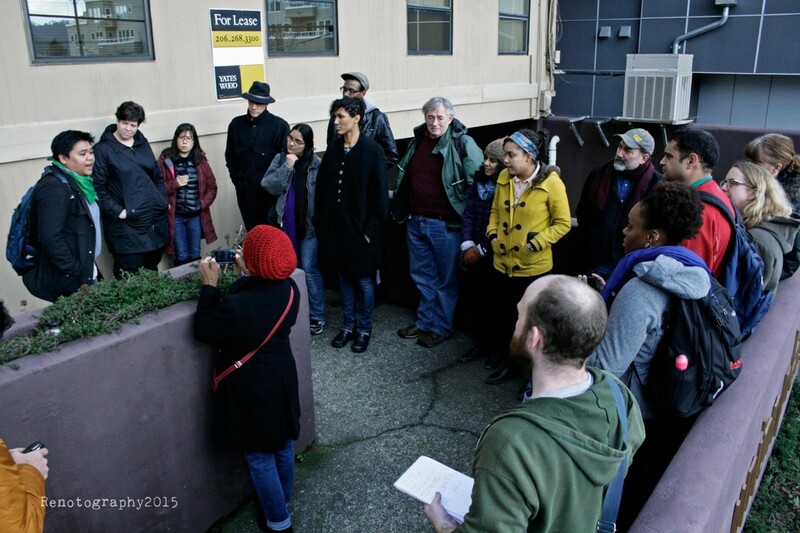 Communities of Color want to see climate action. But it is critical that we lead with a winnable and equitable solution. I-732 is not a winnable policy and it’s not an equitable policy either. Moving forward with a losing approach harms our chances of building a movement. It makes it less likely we will be able to successfully win a carbon pricing initiative in the near future. And it doesn’t have to be this way. We believe we are in a critical moment and that 2016 could be the year to send an initiative to the people. 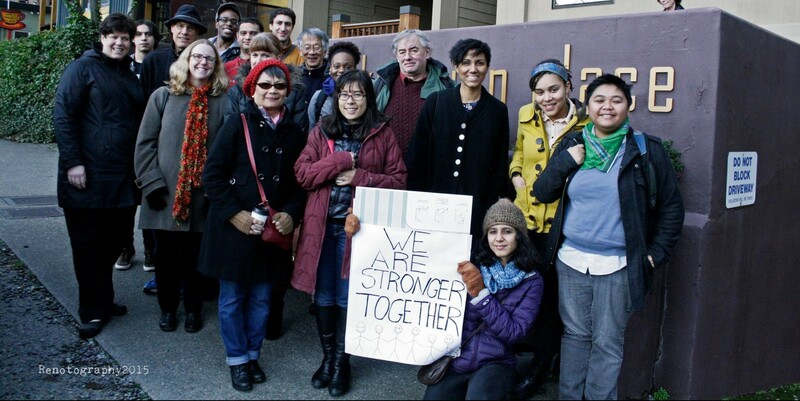 Carbon Washington can take the organizing it has done within their own community and join with the organizing already done among communities of color, labor, business,and environmental organizations. Together we’re strong enough to build the powerful movement necessary to fight the fossil fuel industry and achieve climate action. Its a movement that would result in a win for our environment, our economy, and all Washingtonians. Climate Justice supporters meet outside the Carbon Washington office after the meeting.